A rare gift for vision, a sense of drama, a genius for the right word, an imaginative sense of people and story are here applied to the beginnings of a great people. Winston Churchill was endowed with a sense of history- and this is an ambitious project into which he has poured his great gifts. 'Begun in 1939, now finished, to be issued in four volumes over the next three years, this will be for the average reader the definitive history; for the student an inspiration for further study. For Sir Winston makes even his earliest period, in the dawn of the island's checkered history, seem alive. One goes through successive invasions, conquests, struggles for power with an awareness of the contribution each invader, each conqueror made to the building of a nation. Romans, Danes, Normans, each in turn became part of the life stream. Men advanced the island's development- or threw it back for long periods. Great figures and events took place on the stage of history. The things that characterize the English speaking race today put down roots that survived. 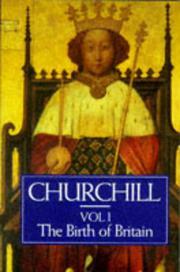 Churchill does not hesitate to illumine the past through contrast and comparison with the present. He makes his story a living, growing thing. His human beings stand out against their times- good and evil as they may be. He reinterprets old legends, retaining much we learned in childhood, but throwing new light upon it. Exciting and revealing reading, this provides the background we need for other reading-fact and fiction, and leaves us with eager anticipation for the volumes to come.